Philippe Herreweghe, Royal Flemish Philharmonic. PentaTone SACD PTC 5186 315. 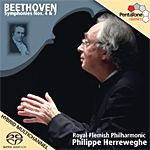 Conductor Philippe Herreweghe and the Royal Flemish Philharmonic continue their Beethoven symphony cycle with this coupling of the Fourth and Seventh Symphonies. Ludwig von Beethoven (1870-1828), always the innovator, had already taken serious orchestral music in new directions by the time he wrote the Fourth and Seventh, and he continued the trend. Not everybody takes to the Symphony No. 4 in B flat, Op. 60 (1806) as much as they do to the composer's more popular pieces. After the monumentally influential Third Symphony, the Fourth can seem somewhat lightweight and something of a letdown. Nevertheless, Herreweghe gives his best, making it seem weightier than it sometimes appears. The conductor begins with a warm, lightly calculated beginning in the Adagio introduction to the first-movement's Allegro vivace, which, after a minute or two, opens up nicely. It isn't excessively fast, but it does display ample vivacious spirit; then it bounces along cheerfully on its main theme. The conductor offers up the dialogues of the Adagio in carefully considered fashion, providing contrasting expressions that he clearly wants the listener to ponder. The quick third movement scherzo comes across as a pleasant compromise between the hectic interpretations on the one hand and the meandering ones we sometimes find. After that, Herreweghe finishes things up with an appropriate flurry of activity. While the Fourth is not one of my own favorite Beethoven symphonies, Herreweghe does what he can to make it an impressive part of the composer's output. The Symphony No. 7 in A, Op. 92 (1812), which critics most often associate with elements of the dance ("The apotheosis of the dance," as Wagner remarked), comes off with a sprightly charm. Again, Beethoven uses a long introductory section before arriving at the familiar Vivace theme; once there, Herreweghe takes it away enthusiastically, but again never without a lilting, jaunty gait. In the second-movement Allegretto, perhaps the conductor doesn't produce the energy of some competing versions, yet he makes up for it with an obvious joy in the moment. The famous slow march, much like the funeral march in the Third Symphony, is full of dark contrasts, which Herreweghe prefers to relate as much as possible to the rhythms of the opening movement. In this regard, it comes across beautifully executed and quite affecting. As in all of his Beethoven readings, Herreweghe steers a levelheaded course in the Presto between analytical contemplation and overexuberant dynamism. Herreweghe just makes it seem like a completely natural transition from the tensions of the previous movement and the jubilation of the finale. When the conductor does wrap things up, he does so with an impressive flourish. Maybe Herreweghe doesn't set the blood to racing as a few other conductors have done in the Seventh, but he does shape the symphony more as a cohesive whole than most others do. This is not to say I consider Herreweghe an absolute first-choice recommendation in the Seventh Symphony, however. For top honors, there are still Fritz Reiner and the Chicago Symphony (RCA or JVC), Colin Davis and Royal Philharmonic (EMI), Carlos Kleiber and the Vienna Philharmonic (DG), David Zinman and the Tonhalle Orchestra Zurich (Arte Nova), Leonard Bernstein and the New York Philharmonic (Sony), George Szell and the Cleveland Orchestra (Sony), Claudio Abbado and the Vienna Philharmonic (DG), Bruno Walter and the Columbia Symphony (Sony), Roger Norrington and the London Classical Players (EMI), and others to take into account. Still, Herreweghe is a strong contender. Recorded in De Roma, Antwerp, Belgium, in 2004 and released by PentaTone in 2011, the sound on this hybrid SACD comes in regular stereo, playable on any CD player, and SACD stereo and multichannel, playable only on a Super Audio CD player. In stereo (regular or SACD), the sound is ultrasmooth, warm, well-rounded, and pleasingly rich and reverberant. Although it seems only moderately distanced, it feels more distant because of the slightly soft acoustic. OK, I would personally have liked to hear a more transparent sound, with greater depth and more air around the instruments; nevertheless, the sonics here are surely easy on the ear, and the wide dynamic range and strong kinetic thrust certainly intensify the listening experience.